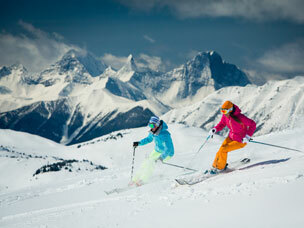 Skiing in Canada is something that everybody should try at least once in their lifetime. Whether it’s the champagne powder of the Powder Highway, the challenging terrain of the Pacific Northwest or the gorgeous glacier lakes of the Rocky Mountains, skiing in Canada is sure to be an unforgettable experience. Canadian ski areas distinguish themselves by their liberal approach to snow grooming: almost the whole mountain is accessible and it’s not rare to see skiers weaving through the trees at the sides of the pistes. Glades, moguls, couloirs… not for nothing is Canada known as the “Great White North”!